The carved houses and tombs in Mesotimolos can be seen in the valley surrounded by volcanic rocks, while it is also possible to come across thousands-of-years-old human footprints in the volcanic remains of the region. Mesotimolos, a city from the Lydian civilization near Düzköy in Uşak's Eşme district, is about to be the subject of archeological studies. Its rocky houses, graves and human footprints in its volcanic remains will be unearthed after scientific studies and will hopefully become a center for history and nature tourism thanks to its geographic beauty and fairy chimney formations. Making on-site examinations in the region with Anadolu Agency, Uşak Governor Ahmet Okur said the region, which is known as the Kale region near Düzköy, has attracted attention as an important historical and geographical destination. The carved houses and tombs in Mesotimolos can be seen in the valley surrounded by volcanic rocks while it is also possible to come across thousands-of-years-old human footprints in the volcanic remains of the region. Okur said, "This is an area that needs to be investigated and examined. There are many ruins belonging to ancient civilizations in the region, which are very valuable reminders that will be brought to the surface by scientific research. It is a historic area that has remained untouched." 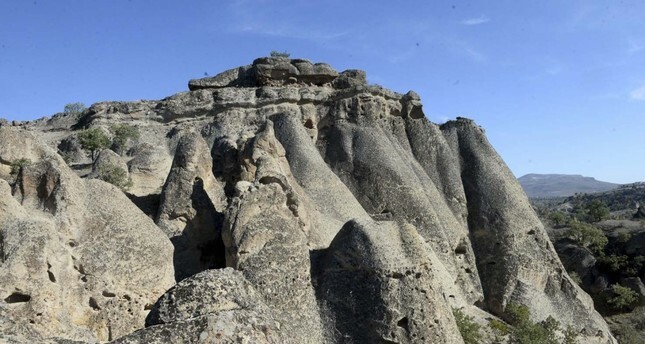 Noting that the region has attracted attention thanks to its formation of fairy chimneys, Okur said they wanted to bring the region into a more prominent place in Turkish history and nature tourism. Stating that the archaeological work will make a significant contribution to the recognition of the region, Okur continued: "The formations of fairy chimneys are worth seeing. This is not a very well-known region. I invite all nature lovers to this beautiful hiking area. It is a region that needs to be recognized and visited." Suggesting that transportation to the region will be made easier, Okur said more visitors will come to the region with the increase in scientific studies, and stressed that due to its proximity to the Ulubey Canyons, its popularity can quickly increase. Conducting soil analysis in the region, Assoc. Prof. Ahmet Atasoy from Uşak University, Faculty of Science and Literature, Department of Geography stated that the research they carried out in the field is ongoing, adding that the region is waiting to be discovered both geographically and historically. Stressing that the age of the human footprints found in the volcanic remains in the field and presumed to be thousands of years old should be determined and the footprints immediately protected, Atasoy said: "We think the footprints belong to the years when the volcanic formation took place. There are similar volcanic structures in the Kula region. In the region, there are rock dwellings and tunnels that go to the valley. In this sense, it is a region with archaeological value. There are strong clues that it was an ancient settlement." He also stressed that a feasibility study should be conducted urgently, the ages of the formations should be determined, and a team of archaeologists should carry out work in the region.